Like other New York City staples called the Jets and Giants, the Teenage Mutant Ninja Turtles are moving to New Jersey. 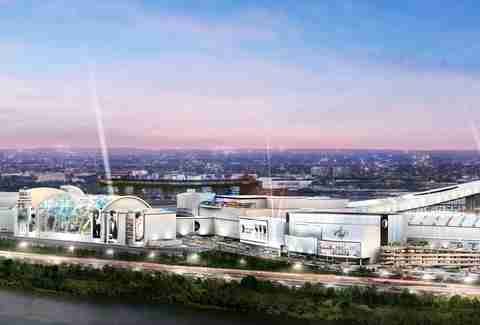 They're dodging Brooklyn rents, yes, but mostly they're going to be part of the brand-spanking-new Nickelodeon Universe theme park, planned for the American Dream mega-mall at the Meadowlands in East Rutherford. Triple Five, the Canadian developer that in 2011 took over the beleaguered American Dream project (irony? 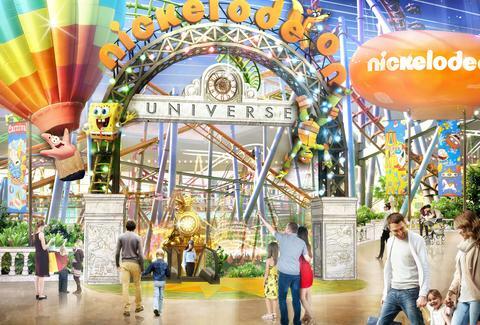 ), has unveiled plans for Nickelodeon Universe, a proposed 8.5-acre Nick-themed wonderland, which when complete would be the largest indoor theme park in the Western Hemisphere. (IMG Worlds of Adventure in Dubai gets to retain its world title belt.) In addition to a TMNT-themed section, it’ll also have rides based on hits like Blaze, Monster Machines, and SpongeBob SquarePants. Plus characters, live shows, and Nick-themed food. No word for Gen-Xers on whether there’ll be anything from Double Dare or Barth's Burgers. The Mall of America, in Minnesota, has a similar, albeit smaller Nickelodeon Universe, in case your hankering to ride Reptarmobiles suddenly spiked. Triple Five owns and runs that mall, as well as one of the world's only comparable complexes: the West Edmonton Mall, in Alberta, Canada, where some of the amusement rides have, uh, killed people. As you're waiting for the Nickelodeon Universe to materialize in Jersey, the phrase “cautious optimism” is probably wise to remember. The developers have offered no projected opening date, and the American Dream project isn’t slated to open until mid-2018. That would be 15 years after the project first broke ground in 2003. Construction completely stopped earlier this year before Triple Five stepped in with $2.65 billion in financing that included $1.15 billion in public bonds. No word yet on whether Jersey residents will get discounts, to see firsthand their tax dollars at work. But if it does come together, it'll be an absolutely ludicrous complex. Nickelodeon Universe will join 450 retail and food outlets, North America’s largest indoor water park, an indoor snow park, a 1,500-seat performing arts venue, a 285ft observation wheel, a 70,000sqft Sea Life Aquarium & Lego Discovery Center, an NHL-size ice rink, and an 18-hole miniature golf course in the complex. All of this will give East Rutherford a pretty valid claim to call itself “the Dubai of New Jersey.” Which, if you think about it, seems a completely logical place for SpongeBob to upgrade that pineapple under the sea. Matt Meltzer is a staff writer with Thrillist who really hopes they have lockers where people can tell jokes at this place. Follow him on Instagram @meltrez1.